Here's another example of why you shouldn't blindly trust the Heart and Stroke's Health Check to steer you to "healthy" choices. Given it's new status as a Health Check'ed item that would mean that according to the Heart and Stroke's dietitians refined white flour + ground beef + almost a day's worth of sodium = super-duper healthy! What? You think there's something not particularly healthy about refined white flours? Could it be their clear cut contribution to the development of metabolic syndrome and diabetes? Beef not good for you? Carcinogenic? Increases the risk of diabetes? Salt increase blood pressure? Increased blood pressure increases the risk of heart attacks and strokes? You'd think that perhaps the dietitians of the Heart and Stroke Foundation would know these facts - after all, they're dietitians and they work for the Heart and Stroke Foundation and doubtlessly they should know all about the dietary contributions to heart disease and stroke, right? Stouffer's Meat Lasagna where the flour is "semolina wheat flour" (white, white, white), the beef is "cooked ground beef" (wanna bet it wasn't extra lean ground beef? ), and the sodium content is 950mg, a short hop away from what a recent Heart and Stroke Foundation press release recommended as a total daily allowance of 1,260mg now has a Health Check. I know, I know, it's probably better than non-health checked lasagnas, but to endorse an unhealthy option as healthy simply because it's healthier than some other options doesn't make it a healthy choice and certainly shouldn't buy it an explicit endorsement from the Heart and Stroke Foundation. "Look for the Health Check logo on STOUFFER'S meals – it's like shopping with a dietitian from the Heart and Stroke Foundation." 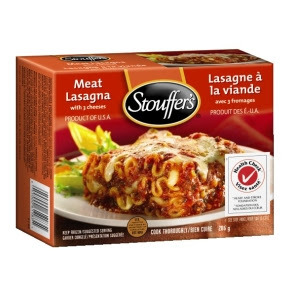 "Enjoy all the taste that’s made STOUFFER’S Lasagna the #1 selling lasagna in Canada for the past year – especially now it’s got the Health Check mark." I can't really blame them, after all they paid the Heart and Stroke Foundation's Health Check good money to apparently sell out.